Versatility for all adventures is the motto for Merry Fisher Marlin, the new launch by Jeanneau. The mega yacht “Metis” entered the water for the very first time, at Benetti’s Livorno shipyard. 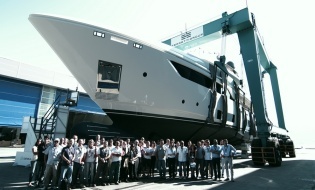 Azimut|Benetti Group is "Shipyard of the Year"
Two superyacht tenders were launced by Hodgdon, as recently announced. Omega 45 is the name of the new TECHNOHULL® flagship, that will be introduced worldwide at the 2019 Miami International Boat Show (February 14-19). Bravo, a prime example of Oceanco’s new wave of forward thinking yachts, was launched on 17th of November. She is the first Oceanco to utilize its innovative L.I.F.E. (Lengthened, Innovative, Fuel-efficient, Eco-friendly) design. The unique in the world 69-meter full custom megayacht “Spectre” deliver was celebrated by Benetti the Italian yacht builder in an exclusive and lavish ceremony at its Livorno shipyard. Heesen announced that on Saturday 3 November 2018, the hull and superstructure of Project Castor were joined together at the facility in Oss.